Here you have an E-Flite BLH7100 Blade Nano QX 3D 2.4Ghz Ready To Fly Electric RC Quad-Copter !! This package will include the Heli, (1) 3.7 Volt 200Mah Li-po Battery Pack, Transmitter, Charger, (4) AA Batteries For The Transmitter, Owners Manual And Original Protective Storage Box !! Please understand that this package includes the complete RTF E-Flite Nano, 3D Quad-Copter, Original Battery Pack, Transmitter, Charging System, Owners Manual And Original Protective Storage Box. You can simply open box, Charge & Install On-board Battery Pack and you are up and flying !!!! You can't go wrong here when you will receive a Ready To Fly Heli, you have a Low Purchase Price Of Only $99.00 and if you buy it now, you can receive it in just a "few days" !!! Nothing! Everything you need to get the Nano QX 3D RTF in the air is included in the box. Just charge the battery and you�re ready to fly! 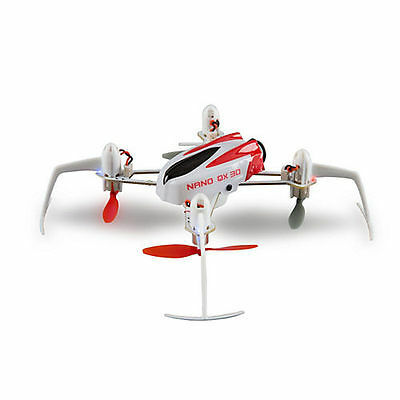 The ultra micro Blade� Nano QX 3D quadcopter breaks the barriers of maneuverability by making high-speed flips, hair-pin turns and inverted flight simple to perform. Intuitive SAFE� technology delivers smooth flight, self-leveling and multiple flight modes. Clever design and reverse motor technology allows the Nano QX 3D to be strong and light, so there�s almost no penalty for error if you practice aerobatics over plush carpet or soft grass�you�ll have a blast! SAFE� (Sensor Assisted Flight Envelope) technology is a revolutionary electronic flight envelope protection system. This intuitive technology allows the Nano QX 3D to battle windy conditions so that performance is consistently smooth. Regardless of pilot skill level, there�s a flight mode available to suit the way you want to fly instantly. Pitch and roll limits are locked to offer a limited flight envelope while electronic self-leveling offers positive stability the instant you release the sticks. You can also flip 360� in any direction at the press of a button. A true 3D flying experience that offers full-range maneuverability with no self-leveling assistance. When flying upright in this mode, 0�50% throttle is negative thrust and 51�100% is positive thrust.